4X Champion, 6X 1st place !!!! At just shy of 10 years old this boy has a histogram that will blow your mind....AFD 19.7!!!! 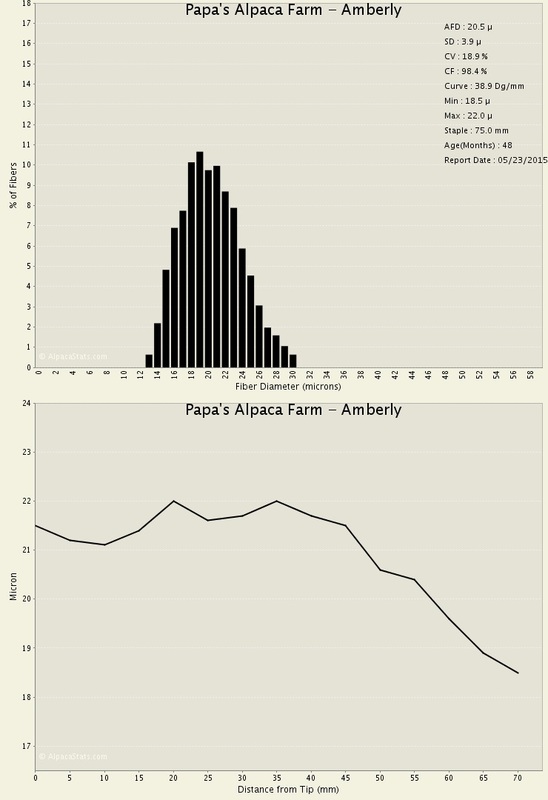 Check out the rest of his histogram! This is an extraordinary male! Like his offspring, he is improving year by year! At 8 years old Ascent has spent most of his time in show rings and earning every moment of every show he has ever attended!! Now with all his ribbons, plaques, and banners which will remain on his show wall along with his portrait! We need to focus more on his fleece and its lingering fineness, exceptional crimp while passing those same genetics on to his offspring! Ascent has many accomplishments, most impressive is his ability to maintain a "20" micron at 7 years old!!! It is completely unbelievable to me. His offspring, of which many are blue ribbon and multi-champions themselves! "At 6 years old, he is the finest of all 6. It is amazing how is is able to retain his fineness for so long. He has great architecture, great poise and perfect uniformity and consistency. He is indisputable my first choice. And back in for the championship he stated that,"He is amazing at 6 years old and finer than some of the younger ones. He would have taken color champion if he wasn't so dusty....JOKE! He has presence, poise and character." So with his final 14th Blue ribbon and 4 championships behind him, we decided to pull him from the show string and allow him to do what he really wants to do....BREED! 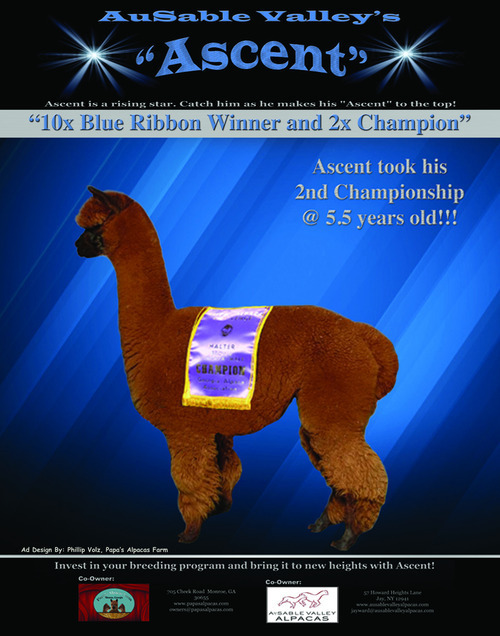 We have opted to give breeding discounts for any Blue Ribbon/ Banner winning Females! Discounts will vary based on the amount of winnings they have! Contact me for information about your female for breeding to this beautiful herd-sire! 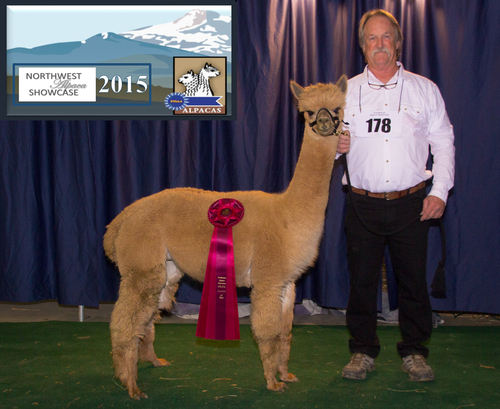 Update: Ascent just won his 15th Blue ribbon at the age of 9 1/2years old at the 2015 VAOBA Alpaca Expo in the Fleece division. This boys still got it. Our eyes popped when we met Amberly – that fleece! Its length was incredible – her cria tipping at six weeks old yielded a blanket with a 2-inch staple length – and it’s fine. Her coverage is awesome. And her confirmation is excellent, as was her size – 53 lbs at 3 months. This is one gorgeous young girl. She comes by it honestly. Her dam Emelia carries Allianza and Accoyo bloodlines to good effect. At age seven she has a dense, bright 20 micron, 18 CV fleece with an excellent handle. I LOVE what this female delivers to her progeny. 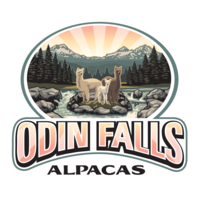 Amberly’s sire "Ausable Valley’s Ascent" has a high quality fleece that has won him multiple championships and 10 blue ribbons – most recently at the age of 6, as the oldest alpaca at the shows. His fleece is fine for a dark animal and particularly notable for its very low micron difference between primary and secondary fibers – just 4.6 microns, when the average is over 8. In addition, his density is considerably above average and especially impressive for his color. He’s stylish, too. Amberly took a 1st place at MAPACA 2012, with Judge Amanda Vandenbosch. Amberly is doing well in the show ring...taking her very first 2nd place in a Level 4 show, in a class of 13 at the North American Alpaca Show! Judge Jude Anderson's comments: "Has excellent fineness, uniformity, great softness and handle, with loads of crimp!" Awesome for a new one!!! 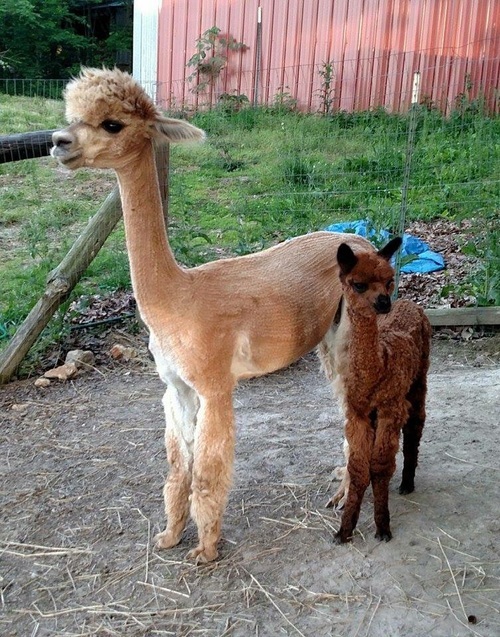 Amberly's first cria was out of Snowmass Matrix for a Spring 2014 cria. She delivered a healthy Medium Brown Female. She was then bred to ACCOYO America Navigator for a Spring 2015 cria. 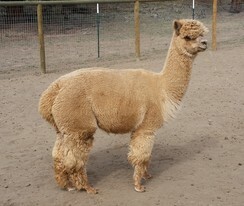 She once again delivered a healthy beautiful Medium Brown Male cria on March 18th. 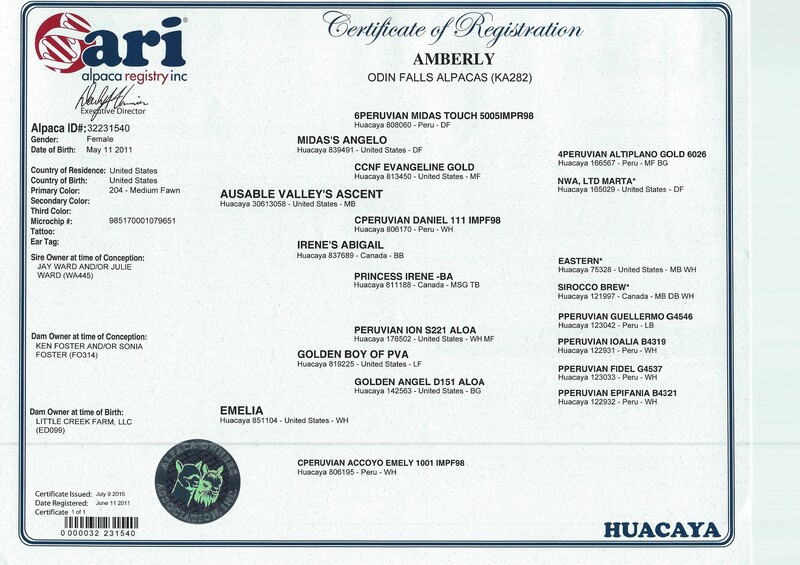 Amberly seems to be throwing her own Sire's color of Medium Brown...he is Auasable Valley's Ascent. We are going to take some time to decide who she should be bred to next. 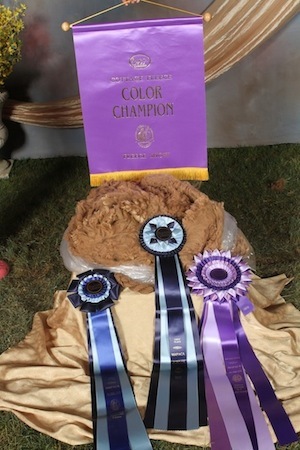 Color Champion 2012 - Georgia Alpaca Association "Fawn Huacaya Female Alpaca of the Year"